A load of massive baloney? 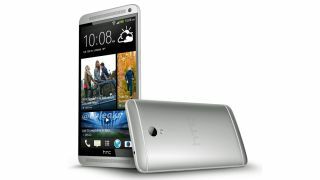 Bigger is better – and HTC seems to know it as more evidence mounts of the HTC One Max being just over the horizon. And following months of dodgy pictures, the notorious @evleaks posted a picture of what he claims to be a leaked press render of the HTC One's inflated version. Typically a tipster of few works, @evleaks didn't have anything to add beyond "HTC T6, non-final artwork". Apart from being, well, bigger, there are a couple of other noticeable small changes in the Max, including the flash which has been moved below the camera. However, HTC's senior global online communications manager Jeff Gordon was quick to jump in and douse the first, posting a comment over on Engadget that it was all a big phoney. "Fake. @evleaks is way off his game," he said, but the other commenters were having none of it. Gordon then took to his Twitter account to vent: "Me: Try to make a helpful comment on @engadget about the company I work for. Engadget commenter: 'Get out of here, troll'." The Max is expected to touch down in September, possibly at IFA 2013, and under that name. We don't think the HTC T6 has quite the right ring to it. You can see what we thought of the HTC One, or check out what we thought of its Mini version.